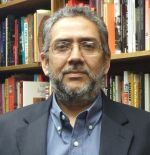 Carlos Aguirre is Professor of History and Director of the Latin American Studies Program at the University of Oregon. He obtained his MA at the Universidad Católica del Perú and his Ph.D. at the University of Minnesota. He is the author of four books: Agentes de su propia libertad. Los esclavos de Lima y la desintegración de la esclavitud, 1821-1854 (Agents of their Own Freedom. The Slaves of Lima and the Disintegration of Slavery, 1821-1854, Lima, 1993), Breve historia de la esclavitud en el Perú. Una herida que no deja de sangrar (A Brief History of Slavery in Peru. A Wound that Continues to Bleed, Lima, 2005), The Criminals of Lima and their Worlds: The Prison Experience (1850-1935) (Durham, 2005), and Dénle duro que no siente. Poder y transgresión en el Perú republicano (Hit Her Harshly. She Doesn’t Feel it. Power and Transgression in Republican Peru, Lima, 2008). He is also co-editor of five books on banditry, crime, prisons, and intellectuals, among other publications. He was a MacArthur Fellow at the University of Minnesota (1990-1996) and a John Simon Guggenheim Fellow in 1999. He is currently working on a history of political imprisonment in twentieth-century Peru.